When you need high-quality brake lines, clutch lines and oil cooler kits, there’s really no one better than the guys at HEL Performance. 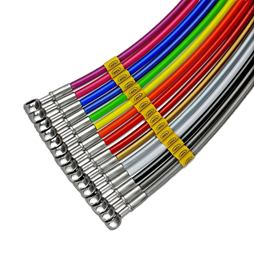 We are pleased to announce that we now supply the excellent range of products from HEL Performance, such as the Braided Brake Hoses, which come in every colour in the rainbow for those who want a vibrant styling for your car and more subtle colours like black, white and carbon. It’s all about choice with HEL. The oil cooler kits from HEL Performance are extremely well regarded in the automotive industry and are ideal for all applications, for the road or the track. Maintaining the optimum oil temperature is ideal to obtain the maximum power and efficiency from your engine, the thermostat provided by HEL Performance prevents the flow of oil to the cooler until the temperature goes beyond the thermostat temperature (either 80 or 92 degrees) which allows the engine to reach optimum temperature quicker and gives extra protection in colder weather. We’re really excited to supply HEL’s excellent range of brake lines, clutch lines and oil cooler kits. This stuff is the best of the best and we can’t wait for you to get your hands on these. The company was born Hose-Equip is 1985 as a trusted Aeroquip distributor. It grew in popularity due to their well-deserved reputation for friendly and high-quality service that made them plenty of repeat customers. They became an MOD contractor and expanded their output. In 2000, they were acquired by the current owners, who focused their output on performance fluid transfer and the name was changed to Hose Equip Limited. The HEL Performance brand was born, along with the world-famous devil tail logo. HEL Performance are committed to innovation and boundary stretching, so they’re constantly coming up with new and better products that you’re sure to love. We love this commitment at Tarmac Sportz. HEL have so many great products in their range for a huge variety of different makes and models of cars. Use a HEL Performance Braided Clutch Hose to massively increase the reliability of your clutch. Whereas competitors use zinc plated fittings, which are prone to corrosion, HEL use stainless steel in their lines and fittings. If you love customising the look of your car, then you’ll love the array of colours that you can choose between; black, white, red, orange, green, yellow, transparent, and much more. They’ve also got a great selection of Braided Brake Hoses which can transform your car’s braking and handling. These brake lines are designed to completely remove that spongy feeling you get when you brake. They make your braking laser precise and absolutely suited to track racing. There’s nothing more important than your safety and we will never sell you any products that fail to meet our safety standards, so it’s a good thing that HEL are committed to quality and reliability.